Robert Woodhead Limited has been selected as one of seven Minor Works Contractors to deliver public sector projects on the East Midlands Property Alliance (EMPA) Minor Works Construction Framework across Nottinghamshire and Lincolnshire. The framework could be worth upwards of £33,000,000 for the contractor over the course of the four year framework. Robert Woodhead has been appointed as sole contractors on the two EMPA Minor Works Construction Frameworks covering the Nottinghamshire and Lincolnshire regions. They will be able to deliver public sector construction projects up to a value of £350,000 in Nottinghamshire and projects up to £2,000,000 in Lincolnshire. The EMPA Minor Works Framework is designed to offer publicly funded organisations an efficient route to deliver construction projects without the need to competitively tender individual or phased projects. This includes the use of a dedicated experienced team who will project manage the construction works from inception to completion with the ability to deliver projects to tight time frames. Robert Woodhead were selected after a robust procurement process based on their commitment to collaborative working, emphasis on local delivery, strong past performance and community values. The Nottinghamshire based contractor has recently moved to larger serviced offices in Edwinstowe to accommodate an expanding workforce. Robert Woodhead has delivered multiple projects for public sector clients across Nottinghamshire including over 700 school projects and will continue to deliver repairs and maintenance services for Nottingham City Council and Nottinghamshire County Council in addition to works secured through the EMPA Minor Works Framework. Robert Woodhead also has a growing presence in Lincolnshire and will utilise satellite offices in Lincoln and Boston to deliver a local service and develop a local supply chain. Robert Woodhead’s specialist heritage team, Woodhead Heritage are currently delivering Lincoln Castle Revealed for Lincolnshire County Council, a multimillion pound Heritage Lottery Funded project. Head of EMPA Alan Coole said: “The constraints on the finances of public sector bodies remain a firm reality, making it so important that they receive value for money from their construction projects. 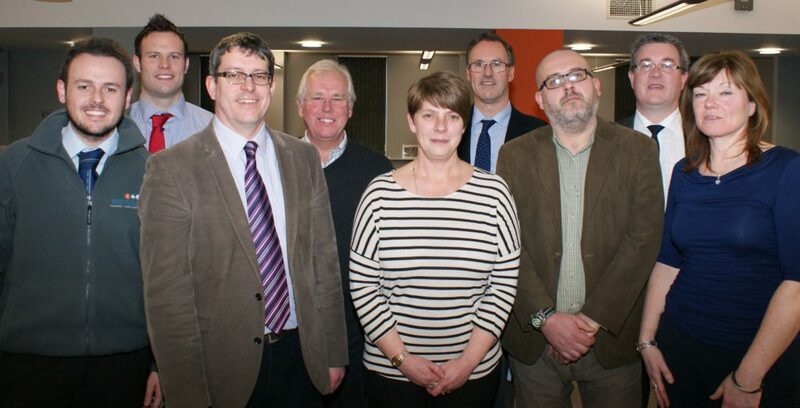 (L – R) Mark Maisey, Alistair Taylor, Glenn Slater, Derek McGrath, Teresa Westwood, David Woodhead, Simon Butler, Simon Boden and Juliet Slater. For more information regarding SCAPE, please contact Mark Stretton or Emily Winsor at Cartwright Communications on 0115 853 2110.